Today, I test out nine of the most popular and requested headphones under $200. I test them out with different people so I can tell you which ones sound the best for casual music listening PLUS which pair I would chose for professional sound/music production. I can use in the field to capturing production sound. For the test, I had each person close their eyes or look away so they didn’t know which headphones they were trying out. This assured that nobody was biased towards a certain brand or judged the headphones based on the price. The overall winner are the Audio-Technica ATH-M50x headphones, which garnered three top votes (including my own). 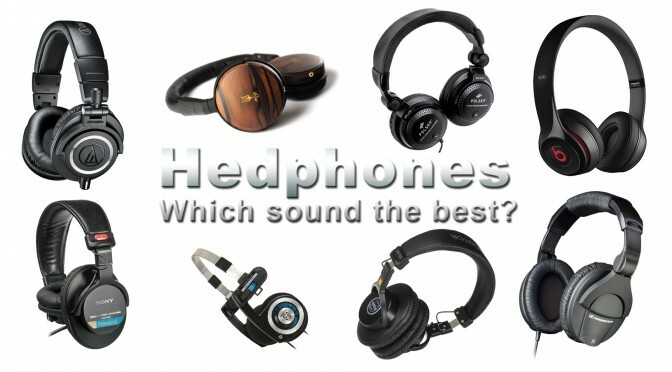 Close behind in second place came the Meze 73 Ebony Wood headphones (two top votes). All the headphones are available at BH Photo Video, except for the Meze 73 Ebony Wood Headphones, which are available on the manufacturer’s website. Please follow the links above to purchase or find out more. What about Yamaha RH5Ma the only headphones that are made in japan and exceed the sound quality of some of the higher end headphones on the market. Your point on graphs are based on pseudo science and laziness in educating the audience. While I appreciate the average joe opinion on the subjects of comfort, I get the feeling no one know’s what they are talking about. While comfort is covered, durability is a subject not discussed enough. Many of the headphone’s featured are purely made for studio use; hence why showing the frequency response would be helpful. The M50x, for example, has boosted treble and bass, which many listeners would not care for. I’m sorry. You look like an interesting dude, but the discussion of headphones is beyond measuring better/worse. It requires an objective and a subjective focus to educate “average joe” that there’s a reason every vocal in a bass heavy song sounds like an instrumental version (or an inside the closet version). I see that you don’t realize that two headphones with identical frequency response still can sound completely different do to the physical build and to the way the sound is colored (or modeled). Hence why concentrating on those specs makes no difference in real world testing. Also different people have different preference. I’ve worked on feature films and music videos for 17 years and so many times I asked different sound engineers, mixers, recorders and musicians and most of them had different preference to use different headphones. Now those where people who work professionally with sound and who all have amazing hearing. Yet none of them have identical hearing. So in this video I wanted some people who work with sound to test out these headphones plus some regular listeners of music. So that the viewer can get more than just pro opinions that concentrate on good headphones for pro sound work. Since many people who requested this video from my were interested in good headphones just for listening to music. Thank you for this nice review, i have decided thanks to you to buy ATH-M20x. Great choice! Those are great sounding budget headphones.